Suitable for all childcare providers, parents and educators. 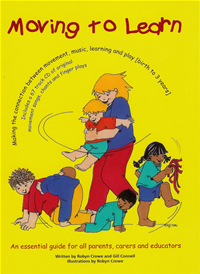 This 67 track CD can be purchased separately without the Moving To Learn manual. It is full of original and exciting songs and chants that have been written specifically to cover the developmental stages of a child aged birth to 3 years. Many of the songs can also be enjoyed by 4 to 5 year old children as well. The instrumental backing, feel and rhythm of the songs vary greatly and were written to be enjoyed by both the adult and the child.